Boston Society of Film Critics, San Diego Film Critics Society Awards: Best Actor (John C. Reilly); Golden Globe Nomination: Best Actor in a Musical or Comedy (John C. Reilly); 19 other nominations. Jon S. Baird’s “Stan & Ollie” tells the true story of how Laurel and Hardy attempted to rally in their final years, only to be faced with their own mortality and changing tastes. However, “Stan & Ollie,” despite the somewhat tragic arc of the characters, is an upbeat, serio-comic movie that does wonderful tribute to the two men, and admirably depicts their routines, both their on-stage antics and off-screen relationship. Reilly’s tragic Ollie is a soft-spoken courtly soul, who’s also an inveterate gambler, often blowing all his cash, leaving him in a dire state. Reilly’s breathes convincing life into Ollie through his big fat suit. Coogan fares just as well as the sharper Laurel, who can’t stop hustling and hoping for a comeback. As Hardy’s health deteriorates, the still vital Laurel braces to go on, but is he any good without his partner? The sour part of the relationship comes from the fact that Hardy, who views the whole thing just as a job than a calling, once made a movie without Laurel, which the latter views as a stunning betrayal. The two are ably supported by Nina Arianda and Shirley Henderson as their loving, but strong willed wives. Both reveal hidden depths, and the movie acknowledges how deeply both loved their respective husbands. 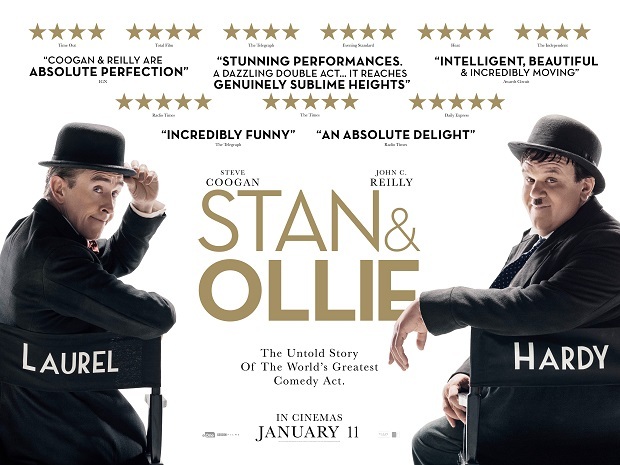 “Stan and Ollie” is expertly acted, with director Baird doing a good job depicting both the lighter side of the duo and the off-screen drama. This is a charming little sleeper.